Surrey Quays 1993 by Bermondsey Art Group. Household Paint. Hidden away on the busy Redriff Road is a local history mural. Anyone popping into the Surrey Quays Shopping Centre will come across two wonderful murals telling the local history of the area. 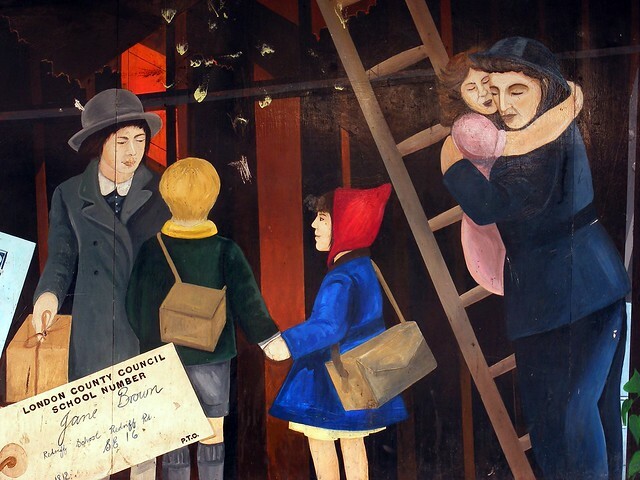 These aren’t the only visual representations of this story as across the road in an old Dockers’ shelter is another local history mural painted in 1993 by the Bermondsey Art Group. The mural is over 2 metres high and about ten metres long situated in a raised position along the back wall. It shows a selection of scenes from the history of the area carefully designed to lead from one scene into the next. The first scene is a sepia view of the Surrey Commercial Docks showing the ships unloading goods. This leads into a colour scene of workers loading timber. The docks dealt with timber from the Baltic and by the 19th century there was 6 timber ponds along with nine docks and a canal. This image leads into an internal scene were a gentleman is reading about the air raids and there is a view of German bomber high in the air above the docks (this image is based on a German propaganda photo montage). In front of this image is a gas mask, ration book and radio -essential items for the London resident. This leads into a picture of children being evacuated whilst a building behind them burns. Surrey Commercial Docks was badly hit by the German air raids during the war. This was the beginning of the decline of the area as a docks. The next image shows a train being moved by a crane. This leads to a portrait of another gentleman sat in front of a warehouse door. There is a plan of a boat behind him and a family (?) photo on his other side. The next image shows goods being moved around the dock. We would be delighted if anyone can shed more light upon the story in this part of the mural. This is another example of a local history mural which could do with a key to explain all the stories in the painting. As it is well hidden, it has escaped being damaged. Let's hope it remains that way. In good condition. Some marks on the mural. A small amount of tagging. Needs a good clean. From Surrey Quays Station, you want to take the first right (Refriff Road) as you head toward the Shopping Centre which will be visible on your right. Do not cross over but stay on the right side of this street. The Dockers Shelter will be visible to you. The mural is located in here.